Mark Hamill has made himself a legend in another geek realm as the voice of the Joker in Batman: The Animated Series and Batman: Arkham video games. 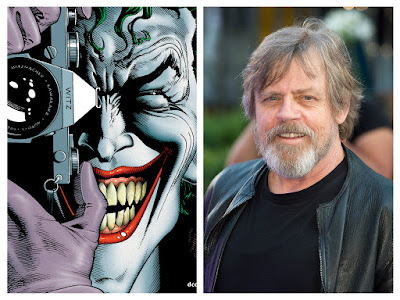 The Star Wars star is reportedly voicing the Clown Prince of Crime once more in the hotly anticipated animated adaptation of the seminal Joker origin story, The Killing Joke, written by Alan Moore and illustrated by Brian Bolland. As we reported previously, the award-winning, best-selling, one-shot story from 1988 is being adapted by none other than Bruce Timm who is back in the fold with Warner Bros Animation. His darker, PG-13 rated Justice League: Gods and Monsters was just released digitally. According to Collider, Hamill has already completed voice work for the direct-to-DVD film. Hamill's enthusiastic and menacing charm invigorates the character with the right about of whimsy and terror. The kind of traits the role requires as the story follows the rise of the Joker from failed comedian to small time crook who is driven to madness. Batman: The Killing Joke is scheduled for release in 2016.